It's not a run, but it's an event to raise money for parkrun and junior parkrun (see * below). 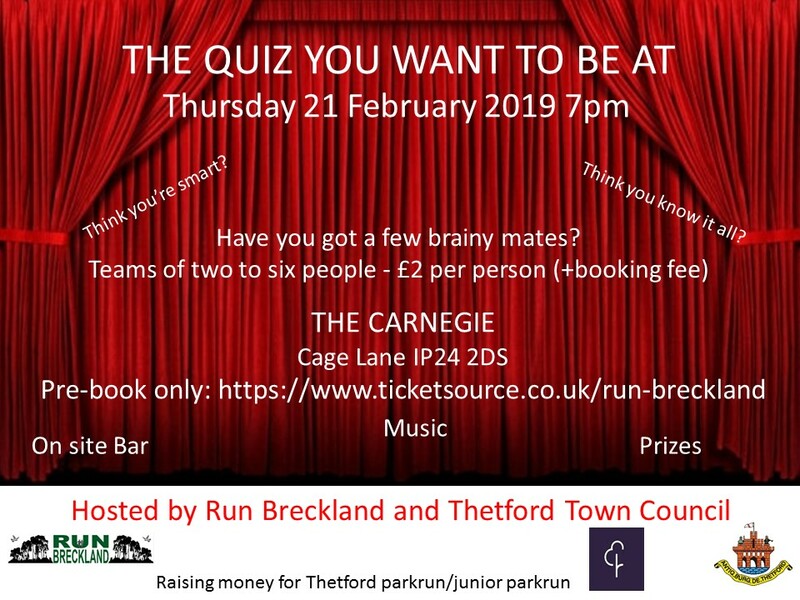 Join us for a fun evening with teams of two to six people, although don't hesitate to book for any number as we can put teams together on the night. There'll be the usual general knowledge categories and also a few surprizes. There'll also be joker rounds prizes! The Bar will be open, and we'll have a halftime iterlude so you can top up (or work on your table quiz). The important thing is to have fun, and help raise funds for Thetford's parkrun events*. These are free, timed 5K runs, one for adults and, soon, one for children. But, in order to be free, we need to raise funds for key items such as signs and tabards, all of which have a shelf life. if you'd like to know more about parkrun, head over to http://www.parkrun.org.uk/thetford/ or you can ask us on the night.